Mike Davis’s work is always worth re-reading. Chapters 2, 3, and 4 were previously published in New Left Review between 2010 and 2016, whereas chapter 1, subtitled ‘Notes on Revolutionary Agency’, is apparently new. Some of the citations in it are as recent as 2014 to 2016, though there are copious references to the author’s reading over the years, so possibly the work has been some time in gestation. The chapter occupies pages 1 to 154, and dwarfs the others considerably. In the title chapter, Davis sets himself a very ambitious and timely project, namely his contribution to Marx’s lifetime project, a Critique of Political Economy. Marx outlined his grand plan a number of times over the years; the most comprehensive one was a multi-volume scheme of 1857, put somewhat more clearly in a letter to Lassalle of 22 February 1858. In that scheme, an analysis of capital comes first (eventually emerging in several planned parts), but is succeeded by a study of wage-labour. This ‘missing’, i.e. never written, volume on wage labour is in Davis’s sights. By extrapolation, rather than by Marxological exegesis or deductive rigour, he proposes to fill this lacuna in at least a preliminary way. He thus reviews working class socialist/communist activism historically to date, using agency as a lens. Agency, he says, has three crucial elements: organizational capacity, structural power, and hegemonic politics. This results in a ‘historical sociology’ (emphasis in original), yielding ‘the ideal-type of a socialist working class in the eras of the First and Second Internationals’ (18-21). In effect, Davis is updating the 1960s classics of working-class history, and doing more than useful service. He focuses on Eric Hobsbawm in particular, but also many others. The chapter will be of particular value for students who are now generations removed from an old guard who were themselves at a similar remove from the glory days of European socialism 1889-1916. There is a huge amount of narrative history here, very deftly served up, and to the purpose for today’s readers. Davis’s style is not the ‘Hegelian-dialectical’ mode of presentation adopted and acknowledged by Marx (a style which was not always appreciated at the time even by Marx’s nearest and dearest). Rather, Davis deploys a set of condensed, but highly readable historical slices into socialist politics followed by italicized “theses”. The substantial contribution to theory and practice in the book, inspired by, and closely related to Marx, thus unfolds in a series of short essays on ‘Radical Chains’, ‘Factories and Unions’, ‘Mass Strikes and Workers’ Control’, ‘The Industrial City’ (the Davis signature piece), ‘Proletarian Culture’, ‘Class Struggle and Hegemony’, and ‘Class Consciousness and Socialism’. This is quite an interesting genre; it is too long for an article, too short for a book, just about right for suitably curious and engaged undergraduates and interdisciplinary postgraduates, not burdened with academic ‘university press’ citational genuflections, yet backed up (in end-notes) with copious references. The thinking is straight from the heart, occasionally from personal experience, present-centered, assertive, and not overly argumentative. Most of all, Davis is open-minded and exploratory, quite like Marx-the-model of someone who just wants to know what’s going on and what to do about it. Thus, this chapter is a worthy meditation, without melancholia. It revives the high spots of working-class activism, as if to let Marx know that the largely unremarked and unrewarded efforts that he made in his own lifetime had not been in vain. And it also lets today’s readers experience some of the thrills and achievements that ‘liberal’ historians, more or less dolefully, have put down as failures. Davis’s stated aim is to ‘get into’ the kind of conjunctural political writing that he rightly attributes to Marx, and rightly notes to be the part of the oeuvre that causes many Marxologues the most difficulty, namely works such as The Eighteenth Brumaire of Louis Bonaparte, also the New-York Daily Tribune articles and other journalism of the 1850s and 1860s. Davis sees himself, and Marx, as resistant to schematic reductionism and deductive truth-seeking – or projective truth-making, looking at it the other way round. Davis is immersed in a critical reception of reliable research, much as Marx famously was in the similarly exploratory, and relatively neglected, sections of his published volume Capital, widely cast as his most rigorous theorizing, leaving the empirical/historical sections somewhat undervalued. David Harvey’s rigorous re-theorizing of the published three volumes of Capital is in a sense the methodological complement and contrast to Davis’s discursive and mole-like political burrowing into the last 150 years of democratic activism. But of course both are committed to a politics that critiques and resists, rather than excuses and embraces, the market. However, there’s no particular need to choose between the two; Capital, volume 1, in particular is capacious enough to contain them both. Perhaps a way to look at this is to see Harvey making good Marx’s very rudimentary work on volume 3, The Process of Capitalist Production as a Whole, and Davis doing sterling work on the more historically based, yet politically activating projected volume Wage-Labour. Davis, as one would expect, is truly at home in urban class struggles, but what is possibly surprising is how good he is at addressing the agrarian ones. He does this by reviewing, the not limited (and limiting) remarks that Marx recorded in his works, once he was at a remove from the local agrarian struggles of Rhineland Prussia 1842-43 that he had encountered when working at the Rheinische Zeitung. Rather, Davis surveys what socialists over and beyond the SPD’s Engelsian orthodoxies were actually theorizing and debating for instance in Hungary and Bulgaria, where urban socialists failed to take advantage of countryside radicalism. And, by contrast, Davis considers the small-holder, small-town radicalism, even peasant-worker unionization, along the Mediterranean littoral, and, as an apparent success, the field-and-town cooperatives and farmer-labourer political parties in Scandinavia. Lenin gets a good press here for consistently, so Davis argues, advocating a peasant revolution of family farms, at least as progressive in the Russian context, and politically necessary (129-36). Of course, there are endless points of disagreement in Davis’s brief discussion to keep us all busy, but what strikes me is the ease with which he derives theory from practice, rather than commenting on practice by extrapolating from texts. Though concluding that ‘Barbarism is all around us’ (154), Davis puts the boot into ‘[von] Mises’ and ‘von Hayek’ for asserting that markets should rule as information-matrices consonant with political democracy and individual liberty. Davis asserts that, ‘[t]here is no longer any insuperable obstacle to unifying economic and ecological parameters […] in dynamic planning models that […] are accessible to public participation’ (152-3). After wikileaks, the Panama Papers and Edward Snowden’s revelations, one could add that capitalized commodification of market-derived information, now of almost inconceivable granularity, is rather more problematic than appears to Davis. But then the resultant freedoms for grossly profligate billionaires and deadly ‘security services’ alike are already making his case for publicly-controlled rollbacks of corporate-state powers. Equalling up governmental offices via Cloud computing to the alleged efficiencies of market-based relations might work, but public accountability would have to be correspondingly upgraded. Chapter 2, on ‘The Politics of Nationalism in 1848’, is a thoughtful rescue-job on all the stick that Marx and Engels get from the well-known claim in the Communist Manifesto that workers have no nation of their own, as if that summarized all their views over forty years or so on ‘the national question’ in Europe and elsewhere. Davis follows Erica Benner’s excellent book Really Existing Nationalisms (1995) very closely, and attributes to Marx a consistent position: ‘… not advocating proletarian nationalism per se, but rather socialist assumption of leadership in national defense’ (p. 171). Overall, what Davis is saying is that class articulates with any number of concepts and interests such that ‘struggle’ is conjunctural, and generally most revolutionary in potential and practice when warring nations destroy and remake the politico-economic relationships to hand. These processes are rather-too-neatly summarized by historians as revolution, counter-revolution, liberation and repression. With chapters 3 and 4 we’re on board the geographer’s camel-train (‘The Coming Desert: Kropotkin, Marx and the Pulse of Asia’ – Marx would have loved to be there), and out in space with the satellite-view (‘Who Will Build the Ark?’ – Marx would have spent years poring over the data). These are short tours-de-force, within which Davis recounts the history of the theorizations through which scientists say what they say about the various environments we discern on the planet, detailing their often contradictory intuitions about how independent planetary processes might be from humanized ones, and then letting us in on the wide variety of moral-political perspectives from which they speak so judgementally. Davis is quite thrilled to find major changes in desertification theory resulting from the fairly crackpot science of civilizational failure on Mars, and also a regular see-saw between those advocating that ‘the environment determines human civilizational success/failure/progress’, and the reverse flow of causal attributions, not least in climate-theories of stability, instability, cyclical regularity, spiking and tipping etc. This is a wonderfully deconstructive history-of-science Royal Society Christmas Lecture that goes with quite a swing. Davis reviews the history of scientists saying what they say up to the present Holocene era of the mandated factuality of climate-change, but knowing a shibboleth when he sees one, Davis wisely leaves us to our own thoughts and judgements. There are consistent slips in German, cheap shots at ‘discourse theory’ and ‘constructionism’ (no references for these straw-people), and Peter Nettl’s name is misspelt, all of which, given the appreciation that Davis has for classically-turned academic work, is annoying. But Davis is throughout inspiring and readable, and Marx can bask in this reflected glory. 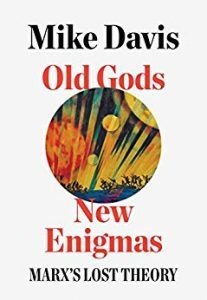 Conversely, though, it has to be said that Old Gods, New Enigmas is not a magnum opus, and that Marx didn’t lose a theory so much as provide a model mode of exploratory analysis and thoughtful critique, of which Davis’s work is exemplary.